It's been a while since I've used this space to jot down some observations as we head into the final month of the regular season. I have much to get off my chest after harbouring things inside for so long! Ok, that's a little over dramatic, but hey, I just watched the Academy Awards Sunday night where actors go on stage and look visually shocked when they win. The thought that always crosses my mind is are they really sincere or are they doing what they do best - acting? The WHL lost a lot of gifted players to graduation or pro after the conclusion of the 2017-2018 season. A total of 48 players scored 30 or more goals that season. Heading into the last week of February, 22 players have scored 30 or more goals in 2018-2019. The first order of business is for the Kelowna Rockets to clinch a playoff spot. Once that is attained, it's all about looking at personal accomplishments. Could Nolan Foote score 40 goals? The 18 year-old has 31 under his belt with 8 games remaining in the regular season. Jamie Benn, Foote's favourite player, scored 33 times when he was in his 18 year-old season. Has an 18 year-old player wearing Kelowna Rockets colours ever scored 40 goals? Brett McLean scored 44 times in 1996-97. It would be nice to see Lassi Thomson set a new record for goals by a European defenceman in a season. With 16, Thomson is three away from breaking Tomas Slovak's mark of 18 set in the 2002-2003 campaign. I often chuckle at the comments made in the media when the opposition coach evaluates the Kelowna Rockets. It often goes against my belief on what the teams real identity is. Are they just trying to be complimentary, or are they really clueless on the strengths and weaknesses of a team that sits uncomfortably in third place in the BC Division standings? Maybe the small sample size doesn't expose ones discrepancies? Whatever it is, the responses are sometimes quite comical. Just think, the Rockets have released/traded or have retired 8 players from their October 1st roster. Erik Gardiner retired. Lane Zablocki, Libor Zabransky, Ryan Bowen and Kyle Pow were released. Wil Kushniryk, Jack Cowell and Braydyn Chizen were traded. That is a lot of turnover this season. 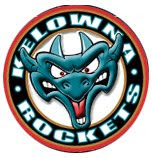 The Kelowna Rockets This Week, a labour of love of mine (Heard every Saturday evening during the hockey season (6 pm) on AM 1150) allows me to touch base with Rockets alumni, many who are still playing, but several that have hung up the skates to pursue other things in life. My latest interview had me reaching out to Chuck Kobasew. The about to turn 37 year-old is living in Phoenix, Arizona after having to leave the game after suffering a series of concussions. On Saturday's show, Kobasew, who scored 42 goals in just one season with the Rockets in 2001-2002, will talk candidly about how bad his concussions where, so much so, that he had to leave his wife and children for a period of time in an effort to recover. The entire interview can be heard this Saturday at 6 pm on AM 1150. I am pleased to report, while Kobasew does suffer recurring symptoms, he is able to live a relatively normal life. In fact, I spoke to him one afternoon after he had just completed a round of golf. Golf is a sport the father of three has always enjoyed. Congratulations to Gordie Ballhorn for being named to the Canada West All Rookie Team. Ballhorn is in his first season with the Saskatchewan Huskies. We spoke to him a few weeks ago on The Kelowna Rockets This Week. Ballhorn and the U of S will face Tyson Baillie, Cole Linaker and the University of Alberta Golden Bears in the Canada West finals this weekend. It was nice to see Luke Schenn make his Vancouver Canucks debut Monday night in a 4-0 win over Anaheim. By all accounts, the 29 year-old played well against the team that sent him to the minors just 8 games into this season after signing him to a contract this summer. To play so well, having not played an NHL game since November is no small feat. The majority of the former Kelowna Rockets defenceman's season has been spent in the American Hockey League. Speaking of alumni...Leon Draisaitl with 38 goals this season? Amazing. I knew he would put up points in the NHL, but I didn't see a 40 goal campaign this soon in the 23 year-old's pro career. Why do the Portland Wintehawks always have the best Europeans, the Everett Silvertips the best goalies and the Kelowna Rockets the best d-men? Discuss. How can a player go from 11 points one season to 52 the next? A 40+ point improvement isn't normal. Portland Winterhawks forward Reese Newkirk has done just that. We will see him in back-to-back games when the Hawks visit Prospera Place Saturday and Sunday. By comparison, Nolan Foote is the most improved player on the Rockets roster year-to-year with 13 more points than a season ago. The Rockets do not have a player that has even doubled his point totals from a season ago. The end result is a below .500 record. You need second or third year players make big jumps in point production to be among the elite in the WHL. The Kelowna Rockets won't have a captain this season. The entire 2018-2019 campaign has been played without one. It begs the question, who gives the 'Captains Speech' at the teams year end awards banquet Sunday March 17th? I was looking at the Kelowna Rockets Wall of Recognition and Achievement the other day at Prospera Place. I was asked by a Rockets volunteer if I could choose one player that is not on the wall that I believe should be, who would that be? Great question. Easy answer. Tyson Baillie. Baillie never played for Canada at the World Junior's, nor will he likely play in the NHL. That said, Tyson Baillie was a big game player, scoring crucial goals when it really counted - the playoffs. Over five seasons, Baillie would collect 310 points in 329 career regular season games, but left his best hockey for the post season. Baillie would score an incredible 27 goals in 64 playoff games including 10 on the teams run towards the 2015 WHL championship. Who will forget his overtime heroics against Seattle in 2013? He scored three goals in that epic, game seven win, as the Rockets rallied from a 0-3 deficit. Baillie's compete and love for the game, specifically in his junior days, was off the charts. Baillie will go down as the best 3rd round pick in Kelowna Rockets history. No one is even close. Baillie won't see his mural on that wall because he doesn't meet the criteria. As of 2004, to be added to the wall a player must have: been awarded the MVP of the Memorial Cup/been captain of a Memorial Cup winning team/won a world junior gold medal/won a world championship or won an Olympic gold medal. If Baillie received exceptional status, he would be my pick. The Kelowna Rockets had tremendous push back in a game where the Blazers often dominate physically. The Rockets proved to themselves and likely the Blazers too, that they won't be a pushover. Teddy Brennan led the physical assault with Mark Liwiski and leading scorer Kyle Topping getting into the act. Even an elbow by Nolan Foote on Kamloops d-man Sean Strange was a sign that the home team wasn't about to be knocked around. I know many won't subscribe to this theory, but sometimes the best way to deal with a bully is to feed them with a dose of their own medicine. Mission accomplished. You often don't see the value in a player until they are out of the line up for an extended period of time with an injury. 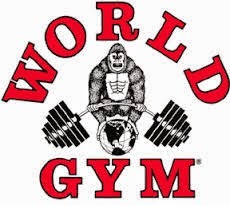 Teddy Brennan falls into that category. Making an impact physically, his size and power is a significant upgrade on a team that has a core of younger players that play timid. With only one goal this season, Brennan brought an aspect of the game that he excels at by being a bull in a china shop. Liam Kindree is a player that is missed when he is not in the top six. After sitting out 9 games with a broken nose, the skill set he provides with a team largely void in offensive talent is noticeable when he's watching from the sidelines. Kindree has arguably the softest hands on the roster with his passing as good as any of the teams 19 skaters. Since his return, the 18 year-old has points in three straight games. Make it 31 goals for Nolan Foote. Impressive, considering Jamie Benn had 33 goals in his 18 year-old season with the Kelowna Rockets. A season later, Benn would score 42 times and was a dominant, angry force. Foote isn't there yet, but if he can play with a little more bite, who knows what type of goal totals he can put up. Foote has goals in three straight games. While Kyle Topping and Leif Mattson failed to hit the score sheet last night, both played a large role in last night's win. What I liked most is their work ethic and ability to creating scoring chances for themselves and others. Mattson does the little things like playing the right way for team success. Getting pucks deep and accepting passes and making sure he gains the red line (small detail) before dumping them into the offensive zone before going for a line change is noticeable. Mark Liwiski has 9 goals. Essentially 6 of them have been scored in the last month. The key to his success is while remaining physical, which is his bread and butter, Liwiski is also shooting the puck more. Three shots on net against the Blazers is impressive for his skill set. Roman Basran had a strong game. An 18 save performance allowed him to earn his 3rd career shutout. Why was Basran so good? His rebound control was solid and he didn't over commit in making a save. In plain English, he let the puck hit him. Often one to make a save look harder than it should be, Basran was calm and cool, which won't earn him highlite reel saves, but if the objective is to get drafted, sometime less is indeed more. A quieter game is a good thing. Shael Higson continues to impress. The 20 year-old d-man has been terrific over the last 6 games with his smart decisions with the puck and his ability to create offense. While not flawless, Higson is showing us glimpses as to why he was named the Brandon Wheat Kings defenceman of the year in 2017-2018. The knock on Higson was he was often undisciplined. I don't see that in his game. I do like that he plays with piss and vinegar though and that certain snarl should never be squashed. The Rockets have won 3 of their last 4 games heading into the month of March where the team will play its final 8 games over 16 days. Leif Mattson led all Rockets with 3+8=11 in February. Nolan Foote (6+2=8) Kyle Topping (2+6=8) and Alex Swetlikoff (3+5=8) had 8 points apiece in February. Lassi Thomson had 5+2=7 during the month. The Rockets are 6-4-1-0 in Saturday home games. The Rockets ended the month of February with a 6-5-0-0 record. Game Day Preview: The Kelowna Rockets close out the month of February with a home game against the visiting Kamloops Blazers. It is the teams 6th game in 9 nights. These two teams are separated by 5 points for third place in the BC Division. The Rockets are in Kamloops to conclude the seasonal series March 8th. Overall, the Rockets are 3-3-1-0 in the seven games against Kamloops, with 4 of the 7 decided by a single goal. The Rockets are coming off a 4-3 shootout win last night in Spokane. Leif Mattson (21st), Nolan Foote (30th) and Alex Swetlikoff (3rd) scored in regulation time while Lassi Thomson and Nolan Foote scored in the shootout. James Porter, the first star, was excellent with 40 saves including two stops in the shootout. The Rockets closed out the three game road trip with two wins in three games after a 5-2 victory in Victoria Monday and a 6-2 setback a night later to the Royals. Overall, the Rockets are 9-12-2-1 in 24 games since the Christmas break. The Rockets are 21-19-4-1 in 45 games under head coach Adam Foote. Following tonight’s game, the Rockets are in Vancouver Friday before welcoming Portland next Saturday and Sunday. Who’s Hot:.Kyle Topping has 5+13=18 in his last 15 games…Leif Mattson has 3+8=11 in his last 8 games….Alex Swetlikoff has 3+5=8 in his last 8 games….Nolan Foote has 9+4=13 in his last 15 games….Lassi Thomson has 7+3=10 in his last 16 games …The Rockets have points in 14 of their last 21 home games (11-7-3-0). Mark Liwiski has 5+2=7 in his last 11 games…Nolan Foote has a shot on goal in every game he has played this season. Broadcasters Notebook: Lassi Thomson’s 16 goals are two shy of the franchise record for goals by a European d-man. Tomas Slovak holds the record (18 goals) in 2002-2003…The Rockets are 5-5-0-0 in 10 games in February….The team is 8-12-1-0 in 21 games since January 5th….Liam Kindree and Teddy Brennan both played in their 100th career games last night in Spokane….Kyle Topping’s next assist will be the 100th of his career….Defenceman Shael Higson played in his 300th career game Monday in Victoria….The Rockets have 9 games left in the regular season. Of those 9, 6 are against teams in the BC Division…The team will play three games in three nights March 1st, 2nd and 3rd…The team has been out-shot in 16 of the last 23 games…The Rockets are 6-10-1-0 in 17 games against a US Division team this season. Three of the five wins have come against Tri City with a single victory over Spokane, Everett and Seattle…The team plays 3 more games against US Division rivals with two games vs. Portland and a single against Spokane.…The Rockets have played 18-one goal games at home this season. Last year they played 15-one goal games at Prospera Place…The team has played in 10-one goal games on the road…The Rockets are 11-14-2-1 against BC Division teams this season…Five members of the Kelowna Rockets have made NHL Central Scouting’s latest rankings. Lassi Thomson is rated 14th, Nolan Foote is ranked 26th and Kaedan Korczak is 31st. Kyle Topping is 195th while Alex Swetlikoff is 217th, Among goalies, Roman Basran is 11th among North American netminders…..Adam Foote was officially named the new head coach of the Kelowna Rockets on October 23, 2018 replacing Jason Smith.,,The Rockets are 9-13-1-0 when playing the second game of back-to-backs. Overtime Games (7): vs. Kamloops (2-1 W) February 2, 2019, vs. Seattle (3-2 Loss) January 30, 2019, @ Kamloops (3-2 Loss) December 28, 2018, vs. Saskatoon (5-4 Loss) December 1, 2018, @ Tri City Nov 30, 2018 (3-2 win), @ PG (4-3 Loss) November 14, 2018, vs. PG (4-3 win) October 27, 2018. 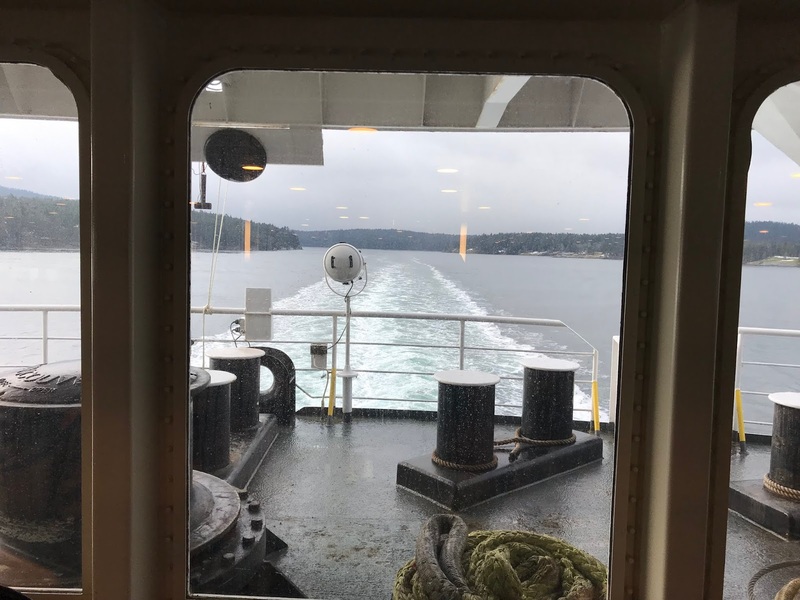 See you Victoria. A revisit in the playoffs perhaps? Wednesday was truly 'hump day' for the Kelowna Rockets. The team woke up following a 6-2 loss to the Victoria Royals with a 7:45 am departure date staring them right in the face. Many bleary-eyed, the players made their way onto the bus knowing that a buffet breakfast awaits them on the BC Ferry once it sets sail from the Swartz Bay Terminal. Physically tired after playing four games in five nights, the team is looking at a well deserved break off the ice. After departing from the Ferry, following the 90 minute excursion to the Mainland, it is all about sleep. Sure, a movie is often thrown into the DVD player, but most if not all the players and staff on the bus attempt to get some shuteye in order to recharge the batteries. Sadly, many miss the views, with much of the scenery along the I-90 nothing short of spectacular. High mountain ranges, significant snow on the shoulders of the three laned highway, which was closed to traffic last week after heavy, heavy snow hit the area, culminates with the eye popping Summit at Snowqualmie. The ski resort features over 2,000 acres of ski area. A quick pit stop in Ellenburg, Washington, a city of 20,000, has the players enjoying Jimmy John's, which in my opinion is a significant upgrade on Subway. It is amazing how quickly the 20+ people on the bus can be fed and watered within 30 minutes and we are off again towards our destination of Spokane, which is still a 2 and a half hour drive away. Another movie is thrown into the DVD player, but again, sleep takes priority for most of the players even though the shots of gun fire and exploding buildings from Mark Walberg's 2018 movie 'Mile 22' resonates throughout the cabin of the bus. With bus driver Greg Link being the MVP on our trek across the State, he gets us safely to the Spokane Veteran's Memorial Arena where we unload the wet hockey gear from the night before and check into our hotel. By the time we arrive at the Double Tree for a two night stay, it is already 6:30 pm, so the entire day has essentially been spent traveling. The best part is eating at the Red Lion BBQ and Pub where the scalloped potatoes are among the best on the circuit and the barbecued beans, which will likely rear its ugly head later, are always worth a second helping. If I could explain the eating establishment in one sentence, I would say don't let appearance chase you away. It would be an easy place to walk by, but the food is great and it has a certain old school charm. The proprietor of the restaurant/pub, John, is a big hockey fan and played the game in his glory days. John played in the Saskatchewan Junior Hockey League, so has a good grasp of how junior hockey works. I know several WHL teams that eat at the Red Lion BBQ and Pub and it never fails to disappoint. After the delicious meal, which features one of several TV's with an NHL game on it, much to our surprise, it is time for a quick walk around the downtown core and then time to shut it down for a good nights sleep. Trust me, bus sleep and bed sleep or two completely different animals. A good hotel bed is a welcome sign after traveling close to 700 kilometers. Victoria Royals Head Coach Dan Price was feeling a little uneasy Monday afternoon despite a 10 point cushion on the Kelowna Rockets for second place in the BC Division. In a pre-game interview before the two teams clashed in a BC Family Day afternoon affair, Price also didn't agree with the suggestion that these two teams are on a collision course for a date in the opening round of the WHL playoffs. "We don't feel like their is breathing room there at all", when speaking about the significant lead for second with a month left in the season. "I know their has been a lot of talk about that (playoff match-up). I think we are too far out to look at it that way. If it was the last two games or four games to go in the season, that would be the case. With this many games to go, its just about two teams trying to accumulate points", Price added." Agree or disagree, the Kelowna Rockets improved to 5 and 2 against the Royals following a 5-2 win Monday afternoon at Save On Food Memorial Centre. Kyle Topping, Mark Liwiski and Lassi Thomson each had a goal and an assist, snapping a two game losing streak and handing the Royals a loss after back-to-back wins in Prince George Friday and Saturday night. In my opinion, it looked like two tired teams. The play was often choppy and the passing was nowhere at the level it needs to be this late in the season. The Rockets were able to grind it out for their third straight win in Victoria this season. At the end of the day, they don't ask how, just how many. James Porter was in net Monday afternoon for a rare appearance against the Royals. Roman Basran has had all the success, up until Monday, with four wins against Victoria and a goals against average of under one. But with three games in four night's playing a factor, Porter was called into duty and played well in the teams 24th win of the season. It was nice to see 20 year-old defenceman Shael Higson score his first goal in a Kelowna Rockets uniform. Playing in his 300 career WHL game, Higson had a terrific effort and was rewarded with power play time because of it. I really liked the game winning goal. Rookie Ethan Ernst had a determined effort to keep the puck inside the zone which allowed Dallon Wilton to pick it up and find leading scorer Kyle Topping alone behind the Royals defence. One quick move by Topping on the forehand and the Rockets were back on top midway through the third period. It was Ernst first point in 28 games, so he was clearly overdue. Good play by a player who has improved despite the lack of offensive numbers. I really liked the way the Rockets defencemen were employed in the game. Sixteen of the 32 shots came from the blue line, with Lassi Thomson leading the charge with 5 and Dalton Gally firing a season high 4 pucks on goal. As previously mentioned, Shael Higson had a terrific game and probably should have been named a star in the building. Higson had 4 shots on net. Looking at the data, maybe we shouldn't be surprised at the number of shots Higson had on net. With the Brandon Wheat Kings earlier this season, Higson had mind blowing 9 against the Swift Current Broncos. Connor Bruggen-Cate found the back of the net for his first goal in 17 games. The 19 year-old was also rocked with an open ice hit by Royals d-man Jake Kustra late in the third period that may result in a suspension. The hit appeared to make contact with Bruggen-Cate's head. Kustra received a charging major. In that instance in what can be considered a dangerous, high hit, it was nice to see rookie Dallon Wilton get involved with his first WHL fight in an effort to defend a teammate. Mark Liwiski continues to impress with 5 goals in his last 9 games. The majority of them are scored from the lip of the crease. It looks like the meat and potatoes Liwiski wouldn't want it any other way. The Rockets played the game without Liam Kindree, who ironically leads the Rockets in scoring against the Royals this season. The 18 year-old will likely play tonight after a 9 game absence with a broken beak. While it looks like a three horse race between Kelowna, Kamloops and Seattle for a final playoff spot, my gut is telling me its actually the Rockets and Blazers that are treading on the thinnest ice. If the playoffs were to begin today, the Blazers would be out along with the Prince George Cougars. My belief is the Cougars won't be seeing the post season for a second straight season even though they are not yet mathematically eliminated. Seattle, from an outsiders perspective, is surging. Sure, they won't be flawless either down the stretch, but its the Rockets and Blazers that are playing more inconsistent hockey then their U.S Division brethren. The only hope for Kelowna and Kamloops is for Seattle to stub their toes more times than not with inter-divisional games against the likes of Everett and Portland. The T-Birds see one of those two teams 7 times in their final 12 regular season games, so they clearly have the hardest schedule of the three. The problem I have with Kelowna and Kamloops is both teams inability to string a series of wins together. The Rockets have improved significantly under head coach Adam Foote, but the problem is so has everyone else. The Blazers are equally inconsistent and can't win on the road. For my money, it is going to come down to three games. Those three games feature the Rockets and Blazers in head-to-head play. Whoever is able to win that mini playoff series, let's call it that, will be playing past the regular season when it ends March 16th. Nolan Foote has 28 goals this season. To put that into context, Jamie Benn, as a member of the Kelowna Rockets in the 2007-2008 season scored 33 times. Benn was also 18 at the time, the exact same age as Foote. The only difference between the two players, who are both blessed with wicked releases, is Benn was already drafted by the Dallas Stars when he scored those 33 goals, while Foote will be selected this summer in Vancouver. Foote has the advantage though of playing three seasons in the WHL while Benn was in his rookie campaign in 2007-2008 after spending time in the BC Hockey League. But again, for Nolan Foote to have 28 goals in his draft year is nothing we’ve seen in these parts for a long, long time. As the Rockets open a three game road trip Monday afternoon in Victoria, what can we expect from a team that will be hard pressed to reach the .500 mark at seasons end. Is winning two of three feasible? I think it is. Both games against the Royals are doable for several reasons. 1) The team has had success against the Royals this season. 2) Two of those victories came on the Island (5-1 and 8-2) and while Victoria goaltender Griffen Outhouse didn't play in either game, the Rockets showed no mercy with lopsided wins. 3) The Rockets should be the fresher of the two teams. Despite back-to-back losses to Everett and Vancouver on the weekend, both were on home ice after essentially five days without a game. The Royals were up north in Prince George Friday and Saturday night, earning two wins against a Cougars team that is winless in 15. I should also mention the Royals closed out 5 straight games on the road. If we are measuring fatigue only, the Rockets should be the fresher and the Royals the weary in the BC Day matinee. Are the Kelowna Rockets a better road team than a home team? I'm guessing - yes. The Rockets are one of only three teams this season with more road wins than home victories. 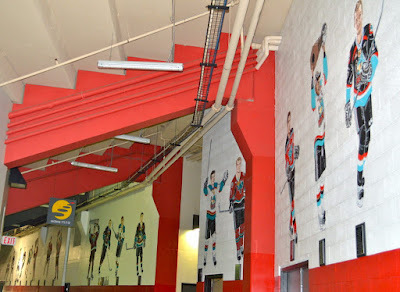 The Rockets have 11 victories at Prospera Place and an impressive 12 away from it. In fact, the Rockets are the only team in the BC Division with more road wins than home wins. As a measuring stick, the Rockets won 26 games on home ice last season and 17 on the road. Will we see Liam Kindree on this road trip? The chance are we likely will, but how effective he will be when he makes his return is anyone's guess? Kindree, an important spoke in the Rockets offensive wheel, hasn't played since receiving a broken nose when he made contact with teammate Cayde Augustine in a game back on January 26th in a 2-1 loss to visiting Vancouver. Todate, Kindree has missed 8 consecutive games. 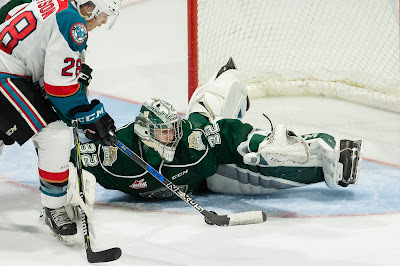 Game Day Preview: The Kelowna Rockets face the Everett Silvertips tonight at Prospera Place. These two teams met back on January 18th, with the Rockets earning a 2-0 win. In the other two meetings, the Tips won by scores of 4-2 (Jan 9, 2019) and 2-1 (November 24, 2018). The most impressive statistic in the seasonal series is the Rockets penalty killing unit, which are 11 for 12 in the three games. Impressive considering the Tips have scored the third most power play goals in the WHL. The Rockets are coming off a 4-1 road win in Kamloops last Saturday night when Lassi Thomson scored twice in the teams’ 23rd victory. Tomorrow night the team hosts Vancouver before traveling to Victoria to face the Royals Monday afternoon (2 pm) and Tuesday before concluding the three game road trip in Spokane a week from tonight. Overall, the Rockets are 7-9-2-1 in 19 games since the Christmas break. The Rockets are 19-16-4-1 in 40 games under head coach Adam Foote. Who’s Hot:.Kyle Topping has 3+11=14 in his last 10 games…Leif Mattson has 1+5=6 in three games….Alex Swetlikoff has 2+3=5 in his last three games….Nolan Foote has 7+3=10 in his last 10 games….Lassi Thomson has 6+2=8 in his last 11 games …The Rockets have points in 14 of their last 19 home games (11-5-3-0)….The Rockets have won 3 of their last 4, having out-scored the opposition 14-10. Broadcasters Notebook: Five Kelowna Rockets prospects are participating in the Canada Winter Games in Red Deer February 15th to March 3rd. 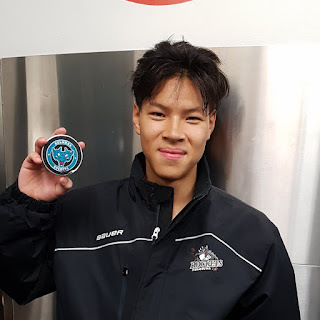 Among those participating is 15 year-old Trevor Wong, a first round bantam pick in 2018….Defenceman Shael Higson will play in his 300th career game Monday in Victoria… The Rockets have played in seven straight one goal games at home….The Rockets have 14 games left in the regular season. Of those 14, 10 are against teams in the BC Division…The team will play three games in three nights March 1st, 2nd and 3rd…The team has been out-shot in 13 of the last 18 games…The Rockets are 5-9-1-0 in 15 games against a US Division team this season. Three of the five wins have come against Tri City with a single victory over Everett and Seattle…The team plays 5 more games against US Division rivals with two games against Spokane and Portland and a single against Everett this evening .…The Rockets have played 18-one goal games at home this season. Last year they played 15-one goal games at Prospera Place…The team has played in nine-one goal games on the road…The Rockets are 10-12-2-1 against BC Division teams this season…Five members of the Kelowna Rockets have made NHL Central Scouting’s latest rankings. Lassi Thomson is rated 14th, Nolan Foote is ranked 26th and Kaedan Korczak is 31st. Kyle Topping is 195th while Alex Swetlikoff is 217th, Among goalies, Roman Basran is 11th among North American netminders…..Adam Foote was officially named the new head coach of the Kelowna Rockets on October 23, 2018 replacing Jason Smith.,,The Rockets are 9-11-1-0 when playing the second game of back-to-backs….The team acquired 20 year-old Shael Higson from the Brandon Wheat Kings for 20 year-old Braydyn Chizen and a 5th round bantam pick. The team then claimed 20 year-old defenceman Matt Barberis off waivers from the Vancouver Giants. To make room for Barberis, the team released overage forward Lane Zablocki, who is now with the BCHL’s Vernon Vipers. Game Day Preview: The Kelowna Rockets face the Kamloops Blazers for the 7th time this season. The Rockets are 2-3-1-0 in the opening six games. Four of the six games have been decided by a single goal and two of the games have been decided in overtime, with both teams winning once. Overall, the Rockets have been out-scored 16-11. Leif Mattson, Kyle Topping and Nolan Foote lead the way offensively with five points apiece in the seasonal series. Mattson leads the team in goals with three. Roman Basran has played in four of the six games, posting a goals against average of 2.25 and a save percentage of .924. The Rockets are coming off a 4-3 win last night over the Prince George Cougars. Nolan Foote scored twice in the victory while Cayde Augustine and Mark Liwiski also found the back of the net. Following tonight’s game, the Rockets host Everett Friday before hosting Vancouver a week from tonight. Overall, the Rockets are 6-9-2-1 in 18 games since the Christmas break. The Rockets are 18-16-4-1 in 39 games under head coach Adam Foote. Who’s Hot:.Kyle Topping has 3+8=11 in his last 9 games…Nolan Foote has 7+3=10 in his last 9 games….Lassi Thomson has 4+1=5 in his last 10 games…The Rockets penalty killing unit is 45 for 55 in their last 13 road games…The Rockets have points in 14 of their last 19 home games (11-5-3-0). Broadcasters Notebook: The Rockets have played in seven straight one goal games at home…Nineteen year-old forward Connor Bruggen-Cate is back in the line-up tonight after serving a two game suspension for ‘actions in game’ against the Kamloops Blazers last Saturday….The Rockets have 15 games left in the regular season. Of those 15, 11 are against teams in the BC Division…The team will play three games in three nights March 1st, 2nd and 3rd…The team has been out-shot in 13 of the last 17 games…The Rockets are 5-9-1-0 in 15 games against a US Division team this season. Three of the five wins have come against Tri City with a single victory over Everett and Seattle…The team plays 5 more games against US Division rivals with two games against Spokane and Portland and a single against Everett.…The Rockets have played 18-one goal games at home this season. Last year they played 15-one goal games at Prospera Place…The team has played in nine-one goal games on the road…The Rockets are 9-12-2-1 against BC Division teams this season…Five members of the Kelowna Rockets have made NHL Central Scouting’s latest rankings. Lassi Thomson is rated 14th, Nolan Foote is ranked 26th and Kaedan Korczak is 31st. Kyle Topping is 195th while Alex Swetlikoff is 217th, Among goalies, Roman Basran is 11th among North American netminders…..Adam Foote was officially named the new head coach of the Kelowna Rockets on October 23, 2018 replacing Jason Smith.,,The Rockets are 8-11-1-0 when playing the second game of back-to-backs….The team acquired 20 year-old Shael Higson from the Brandon Wheat Kings for 20 year-old Braydyn Chizen and a 5th round bantam pick. The team then claimed 20 year-old defenceman Matt Barberis off waivers from the Vancouver Giants. To make room for Barberis, the team released overage forward Lane Zablocki, who is now with the BCHL’s Vernon Vipers. Game Day Preview: The Kelowna Rockets face the Spokane Chiefs for the second of four times this season. The Rockets and Chiefs met last Friday in Spokane, with the Chiefs earning a 4-0 victory. It marked the 5th time this season the Rockets have been shut out this season. These two teams close out the seasonal series in Spokane February 22nd before meeting again at Prospera Place on March 13th. The Rockets are coming off a 2-1 overtime win against the Kamloops Blazers Saturday night. Lassi Thomson scored the game winning goal on the power play while 15 year-old Trevor Wong scored his first career WHL goal, also on the power play, in the one goal win. Following tonight’s game, the Rockets host Prince George Friday before traveling to Kamloops to face the Blazers on Saturday. Overall, the Rockets are 5-8-2-1 in 16 games since the Christmas break. The Rockets are 17-15-4-1 in 37 games under head coach Adam Foote. last 13 road games…The Rockets have points in 13 of their last 17 home games (10-4-3-0). Broadcasters Notebook: Nineteen year-old forward Connor Bruggen-Cate has been suspended for two games by the WHL for ‘actions in game’ against the Kamloops Blazers Saturday night. Bruggen-Cate will miss tonight’s game and Friday’s against Prince George. Blazers d-man Montana Onyebuchi was also suspended two games for his third period attack on Bruggen-Cate….Tonight’s game is very unique as it marks the first time that three Kelowna players are on the ice surface at Prospera Place in a WHL game. 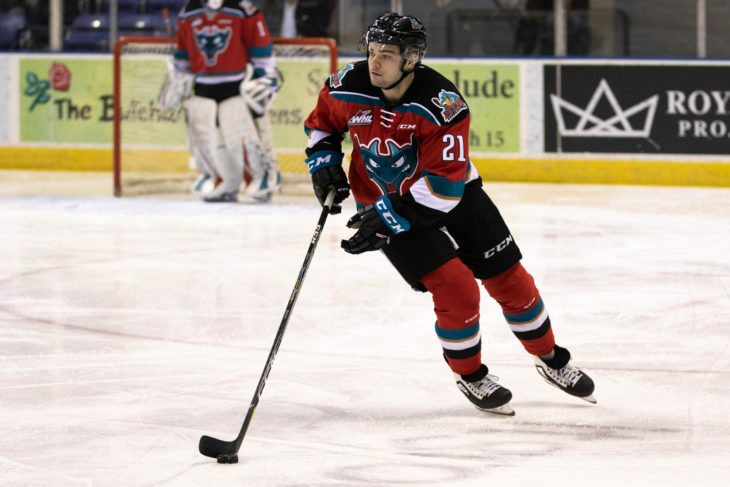 Rockets forward Alex Swetlikoff was born in Kelowna while Chiefs forwards Jack Finley and Eli Zummack also call Kelowna home. Findley was born in St. Louis while his father was playing in the NHL….Dan Lambert returns to his old stomping grounds tonight. 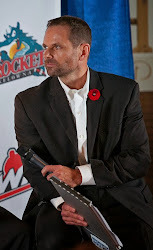 The second year head coach of the Spokane Chiefs spent six seasons with the Rockets coaching staff, five as an assistant to Ryan Huska and one as a head coach in 2015….The Rockets have 17 games left in the regular season. Of those 17, 11 are against teams in the BC Division…The team will play three games in three nights March 1st, 2nd and 3rd…The team has been out-shot in 13 of the last 15 games…The Rockets are 5-8-1-0 in 14 games against a US Division team this season. Four of the five wins have come against Tri City with a single victory over Everett and Seattle…The team plays 6 more games against US Division rivals with three games against Spokane, two with Portland and a single against Everett.…The Rockets have played 16-one goal games at home this season. Last year they played 15-one goal games at Prospera Place…The team has played in nine-one goal games on the road…The Rockets are 9-12-2-1 against BC Division teams this season…Five members of the Kelowna Rockets have made NHL Central Scouting’s latest rankings. Lassi Thomson is rated 14th, Nolan Foote is ranked 26th and Kaedan Korczak is 31st. Kyle Topping is 195th while Alex Swetlikoff is 217th, Among goalies, Roman Basran is 11th among North American netminders…..Adam Foote was officially named the new head coach of the Kelowna Rockets on October 23, 2018 replacing Jason Smith.,,The Rockets are 8-11-1-0 when playing the second game of back-to-backs….The team acquired 20 year-old Shael Higson from the Brandon Wheat Kings for 20 year-old Braydyn Chizen and a 5th round bantam pick. The team then claimed 20 year-old defenceman Matt Barberis off waivers from the Vancouver Giants. To make room for Barberis, the team released overage forward Lane Zablocki, who is now with the BCHL’s Vernon Vipers. Broadcasters Notebook: Did you know that Rockets head coach Adam Foote and Chiefs head coach Dan Lambert were teammates with the Quebec Nordiques? Foote wore sweater #52 while Lambert wore #50 as raw rookies in the 1991-92 season….Trevor Wong is in the lineup this evening. The 15 year-old will suit up for his third game in the WHL after making his debut October 27th against Prince George. Wong was the Rockets first round pick (18th) in the 2018 WHL bantam draft….The Rockets have 19 games left in the regular season. Of those 19, 12 are against teams in the BC Division…The team will play three games in three nights March 1st, 2nd and 3rd…..The team has been out-shot in 12 of the last 13 games…The Rockets are 5-7-1-0 in 13 games against a US Division team this season. Three of the four wins have come against Tri City with a single victory over Everett and Seattle…The team plays 7 more games against US Division rivals with four games against Spokane, two with Portland and a single against Everett.…The Rockets have played 15-one goal games at home this season. Last year they played 15-one goal games at Prospera Place…The team has played in nine-one goal games on the road…The Rockets are 8-12-2-1 against BC Division teams this season…Five members of the Kelowna Rockets have made NHL Central Scouting’s latest rankings. Lassi Thomson is rated 14th, Nolan Foote is ranked 26th and Kaedan Korczak is 31st. Kyle Topping is 195th while Alex Swetlikoff is 217th, Among goalies, Roman Basran is 11th among North American netminders…..Adam Foote was officially named the new head coach of the Kelowna Rockets on October 23, 2018 replacing Jason Smith.,,The Rockets are 7-11-1-0 when playing the second game of back-to-backs….The team acquired 20 year-old Shael Higson from the Brandon Wheat Kings for 20 year-old Braydyn Chizen and a 5th round bantam pick. The team then claimed 20 year-old defenceman Matt Barberis off waivers from the Vancouver Giants. To make room for Barberis, the team released overage forward Lane Zablocki, who is now with the BCHL’s Vernon Vipers.